A one-day doctoral training workshop held at the University of Manchester, 4th December 2014. Prefiguration involves experimentation with ways of enacting the principles being advocated by activist groups in the here and now. ‘Prefigurative politics’ collapses traditional distinctions between means and ends in political action, and focuses attention on the possibility of realising change in the present. As Marianne Maeckelbergh explains, ‘prefiguration holds the ends of political action to be equally important as the means, and has the intention (over time, or momentarily) to render them indistinguishable’ (Maeckelbergh 2009: 88). The concept of prefiguration stimulates a focus on the form as much as aims of activism, and creates a context for thinking about how a radically democratic political process might be reinvigorated, both in the processes of political action and the broader public sphere. 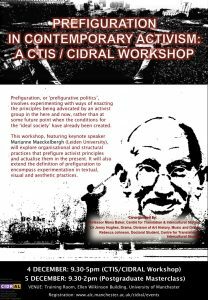 Prefigurative politics allows for tactics and strategies of activism to be improvised anew in response to changing environments, supporting an open process of learning and adaption which ensures that, in each moment of action, ‘the possibility for another world exists’ (Maeckelbergh 2009: 229). Much of the literature on prefiguration explores organisational and structural issues, such as the ways in which activist groups create in their own interactions and practices a model of the society they envision (often non-hierarchical, non-representational, respectful of diversity, and based on a logic of solidarity). We invite potential contributors to present research focusing on these issues, and we also hope to include contributions that explore how this definition of prefiguration might be extended so as to encompass textual, visual, performative and aesthetic practices that prefigure activist principles and actualise them in the present. The emergence of the global justice movement in the late 1990s signalled a ‘cultural turn’ in contemporary activism (Amoore 2005: 357). Modes of activism now commonly embrace the cultural, artistic and theatrical as a means of drawing attention to, experimenting with and projecting new modes of being in the here and now. The extension of the notion of prefiguration to include the cultural domain will support a stimulating range of conversations about contemporary forms of activism that traverse disciplinary boundaries. The workshop is aimed primarily at doctoral students. Apart from the keynote presentation, the event will feature presentations by doctoral students whose work engages with the proposed theme. Over the past few decades, ‘prefiguration’ as both practice and theory of social change has slowly come to occupy a central place in political struggles around the world. More and more scholars are exploring prefigurative politics in an attempt to understand what these approaches to social change might mean for social movements, contemporary politics, and for the types of social change we can hope for in the future. In the analyses of the movements of the 1960s and 1970s, prefiguration was closely linked to the notion of ‘cultural politics’. This allowed analysts to see a much larger set of social relationships as essential to creating meaningful political change. Critics, however, argued that prefiguration was not a viable strategy for ‘real’ social change because it emphasized interpersonal relationships and left political and economic structures untouched. This paper draws on two decades of participation in prefigurative movements, specifically research on the alterglobalization movement and the recent wave of assembly and occupation-based movements, to explore the day-to-day dynamics of prefigurative politics and offer some key points for reflection on the possibilities and problems of prefiguration as a strategic practice in ongoing struggles to transform democratic politics and capitalist economy. The notion of prefigurative politics relates to a plethora of terms and ideas including micropolitics, utopia, ‘counter-power’ and ‘new’ forms of political participation. Their use raises issues about alternative or heterodox practices or institutions, the politics of political action itself, and the relationship between the present and the future. Work which raises these ideas indirectly poses solutions to interrelated crises of legitimacy, efficacy and imagination on the political Left. The paper begins by reviewing key claims from this work in three sections, using examples from recent social movement mobilisations to illustrate the argument. First, I argue that dichotomies between horizontality and hierarchy, prefiguration and ‘strategy’, or ‘community’ and ‘organisation’ have led to unnecessary division and misleading rhetoric about political legitimacy. Secondly, ‘prefigurative’ modes of organising are limited in terms of efficacy, but are useful vehicles for building capacity. Thirdly, emphasis on existing projects, experiences, practices and institutions provide necessary optimism and ideas in the current absence of radically alternative political economic systems; but matters of linking and scaling up require renewed attention. Prefigurative politics, which dismantle the classic distinction between the political goals of an activist group and the means by which they seek to achieve them, holds ‘the ends of political action to be equally important as the means, and has the intention (over time, or momentarily) to render them indistinguishable’ (Maeckelbergh 2009: 88). Taking the idea that ‘to preﬁgure is to anticipate or enact some feature of an ‘alternative world’ in the present’ (Yates 2014: 4) as a point of departure, this paper proposes to explore the manner in which the Open and Wayside Theatre, Sri Lanka’s first political street theatre group, embodies its politics in the formation of the troupe and the performance practices that it has evolved over its forty year history (1974-2014). The theatre practices of this troupe will be viewed in the context of two conflicts in Sri Lanka which span the major part of its postcolonial existence (1971 – 2009). Drawing on interview and archival data collected during a fieldwork trip to Sri Lanka in 2013 as well as selected performance texts, the presentation will dwell on how the group democratises theatre practices and cultural production through its own structuring which is non-hierarchical and based on a logic of solidarity, the choice of performance spaces and by providing access to a range of performance texts that its audiences, mainly comprised of lower middle and working class people in Sri Lanka, may otherwise not have access to. Accordingly, attention will be paid to organisational and structural features as well as the performative and aesthetic practices of the troupe that prefigure activist principles and actualise them in the present. This paper analyses from a socio-narrative perspective the official music video of the 2009 song ‘P.H.A.T.W.A’, by Canadian-Iraqi political rapper The Narcicyst (“Narcy”). Drawing a distinction between performative and constative forms of self mediation (Austin 1975), I will argue that the video is an example of performative social construction which is prefigurative of emerging epistemologies of the globalised era. In the sociological version of narrative theory, narratives are considered constitutive, rather than simply representative, of reality (Somers 1994; Baker 2006). They are furthermore not restricted to verbal forms of expression. This being so, recent conceptualisations of affect and precarity in critical theory and cultural studies can be called upon to enrich our understandings of contemporary narrativity by illuminating public spheres (narrative environments) as “affect worlds” (Berlant 2011) where rational or deliberative modes of thought are exposed as increasingly inadequate, masking the precarious nature of many people’s lived identities. In this context, performativity becomes a key political tool for the creation of global communities of affinity for individuals whose identities and values are not accounted for by the dominant narratives of liberal democratic society. In the case of ‘P.H.A.T.W.A’, I will demonstrate how the narrator-character of Narcy bridges the diegetic and non-diegetic worlds through his rap performance, using both music and humour to assert his identity in a form of ‘conscious individualism’ (Martin 2010) characteristic of the narratives of activist hip hop artists. In using his ontological narrative to critically and creatively engage with the War on Terror meta narrative, Narcy affectively connects with others in a similar position of precarity and enacts breach of the normative epistemological structures of the hegemonic political order, thus prefiguring alternative modes of social engagement and thought. In the study of activism and social movements, prefiguration is seen as the creation of a future through present social relations (Sitrin 2006). This concept has been developed recently, for instance, in relation to the alter-globalisation movement and to Occupy, which embody in their everyday practices the same principles of democracy, openness, and tolerance they advocate for in an ideal future society (Maeckelbergh 2011). But instances of prefiguration can also be found in activist artistic practice, as open collective performances and artistic projects put into action values and ideals akin to a horizontal post-capitalist form of social organisation. In this paper I will look at the politics of art activism in the fight against oil sponsorship of the arts in the UK. Groups like Liberate Tate, Shell Out Sounds and Reclaim Shakespeare Company have in the last few years repeatedly invaded and intervened cultural institutions in London, denouncing the dirty links between the arts and the oil industry, and demanding the end of sponsorship deals that greenwash Big Oil’s public image. These artistic actions have contributed to making the debate on fossil fuels and art sponsorship more visible, and have even succeeded at affecting the links between oil companies and certain arts institutions. In addition, the participatory and interventionist nature of these actions has challenged certain cannons of artistic practice, using art spaces in unconventional ways, and putting forward values and processes that differ from the art world’s prevalent norm. Taking this into account, I will explore the creative processes and strategic choices of these activist performances in order to answer the following questions: what is the potential for prefigurative politics in creative actions against oil sponsorship? Furthermore, looking specifically at the artistic processes that challenge institutionalised norms, I will move on to ask: can these actions be seen as enacting prefigurative politics of social relations and artistic practice, despite this not being their primary objective? In order to answer these questions I will refer to instances from my ongoing ethnographic research, which focuses on the politics of contemporary art activism in the UK. The concept of prefiguration has been most commonly applied in reference to radical political moments characterised by non-hierarchical, decentralised organisational structures that emphasise participatory democracy through consensus decision making processes (Boggs 1997, Maeckelbergh 2011). In the Chinese context, where offline public organising and protests are risky and more likely to be suppressed and online discussions about sensitive political subjects are heavily censored, online communities organised around mundane topics such as pop and media culture can offer an important entrée for exploring prefigurative politics not only as overtly ‘political’ activity, but also as everyday practices that seek to “integrate personal and ‘lifestyle’ issues into politics” (Boggs 1997: 119). Focusing on one type of apolitical networks – namely zimuzu (i.e. online communities that produce and distribute Chinese subtitles for foreign media products) – formed by ordinary Chinese youth, this presentation examines how mundane online interactions can transform into more complex and community-oriented actions through prefiguration. In particular, it looks at how participants in such networks make use of the cultural and technical resources available to them as they make sense of themselves and their daily co-creational experiences, all of which have fostered a new set of values around self-expression, openness, and altruism. Most notably, these values originate from pursuing personal interests, not from enacting political and social change, during ongoing online interactions with disparate (yet likeminded) individuals. In doing so, participants are transforming their networks into inclusive communities based on trust and solidarity outside of authoritarian institutions and exclusive guanxi networks; and slowly accumulating skills and values necessary for a civil society. Contrary to popular claims that activism defines and motivates Chinese Internet users (Yang 2009), this presentation attempts to show that users, particularly the post 80s and 90s youth, turn to the Internet as a prefigurative space for mutual exploration and expression of shared interests and identities. At its most basic, guanxi (关系) refers to the notion that personal relationships are built through favours. This aim of this paper is to open up a conversation about the ‘figure’ in prefiguration and contemporary activism, by examining two extraordinarily potent gestures from recent protests. The current wave of demonstrations that followed the shooting of a young black man, Michael Brown, by a white police officer in Ferguson – a suburb of St Louis (US) – in August of this year, feature protesters holding their arms in the air and chanting ‘hands up, don’t shoot’, an emotive embodiment of the reported final stance and words of Michael Brown. More than a year earlier and six thousand miles east of Ferguson, after the violent eviction of demonstrators occupying Taksim Square in Istanbul, Erdem Gündüz – a professional choreographer and dancer – stood silently for more than eight hours. His gesture of standing quickly attracted the interest of broadcast and social media, and within hours Gündüz was joined by hundreds of others, standing still in the square. It has become axiomatic to state that protest draws on the communicative potency of theatricality and performance as a tactic and strategy. My aim here is to draw on theories of gesture in theatre studies and political philosophy to examine how theatrical gestures might figure modes of subjectivity and relation that provide new perspectives on activism as a prefigurative domain. As Josette Féral has commented, ‘theatricality’ arises with the actor intervening in everyday time and space in ways that generate ‘a cleft in the quotidian that becomes the space of the other, the space in which the other has a place’. This paper draws on Féral’s proposal, alongside Marcel Mauss’s essay, ‘Techniques of the body’ (1935), Giorgio Agamben’s ‘Notes on Gesture’ (2000), and Brian Rotman’s notion of the ‘gesturo-haptic’, to argue that theatrical protest gestures rehearse and prefigure modes of ‘being besides ourselves’ in a world where there is no place to stand outside. Josette Féral (2002) ‘Theatricality: the specificity of theatrical language’ SubStance, 31: 2 & 3, 94-108. Marcel Mauss (1992 ) ‘Techniques of the body’ in Jonathan Crary and Snaford Kwinter (eds.) (1992) Incorporations, Cambridge, Massachissetts: MIT Press. Brian Rotman (2008) Becoming beside ourselves: the alphabet, ghosts and distributed human being, Durham & London: Duke University Press. From classical political philosophy onward, politics has often been closely related to a certain notion of ‘free time’. Political action, or engagement in the public sphere, presupposes that one has a certain extent of free time at one’s disposal. It is the activity reserved for those spaces and moments in which – or persons for whom – the maintenance or reproduction of ‘bare life’ is not at stake, so that the engagement with public affairs can be truly disinterested. To put it stronger: this intimate relation between political action and free time is commonly understood to be at stake in politics itself. Hannah Arendt critically distinguishes action from work, counterposing the instrumentalism of the latter to a radical conception of freedom closely identified with the former. Freedom is not the end or means, but “rather the substance and meaning of all things political.” Autonomist Marxists like Antonio Negri or Harry Cleaver argue that political action consists of the very process of subtraction from the capitalist relations of production and the time lost in it. Jacques Rancière shows how many historical and contemporary examples of political action must be understood as attempts to withdraw from dominated time and thus to reclaim control over it. The global wave of protest movements that the world has witnessed in the past years is often understood to revolve around the occupation and recomposition of public space. In the tent camps of Tahrir Square, Zuccotti Park, Puerta del Sol, or Gezi Park (to name but a few), alternative forms of political organization and relations of production and property were prefigured. But the subtraction and creation of free time – neither as a precondition for politics nor as its end or outcome, but rather as its very matter – is equally fundamental to these prefigurative movements and practices. A lot is to be learned from these recent movements and the ways in which they prefigure new time regimes. Through strategies such as precarization and flexibilization, neo-liberalism continuously colonizes – and, thus, depoliticizes – our free time. This increasing pressure for our everyday lives to be more productive, efficient, and flexible in all its aspects must be met by a politics of free time. This paper considers the efficacy of Burning Man as a form of prefigurative practice for activists. Burning Man shares values prevalent within social movements; lived experience of participatory culture, sustainability (Leaving No Trace), radical self-organization and challenging commodification through ‘gift’ economy. Accordingly, many activists attend (Code Pink, Reverend Billy). It provides opportunities for activists to experience prefiguration in an immersive, safe environment, removed from some of the constraints of more public protest settings. Activists experience an alternative horizontal societal model, without the pressure of securing immediate impacts on policymaking or fearing police intervention. Furthermore, Burning Man plays a multi-faceted role in making activism more sustainable. As a Temporary Autonomous Zone, Burning Man offers activists celebration, respite and sanctuary. It also provides a site for activists to reflect, share tactics, strategies and training. As a mode it embodies activist principles, but also provides inspiration and hope through the currency of creativity and imagination. Burning Man creates a utopian performative for activists to ‘share experiences of meaning making and imagination that can capture fleeting intimations of a better world.’ Furthermore, in bringing together 66,000 people in extreme desert conditions, it provides a model where determination and collaboration render the seemingly impossible possible. Crucially, Burning Man’s activities have extended beyond the Temporary Autonomous Zone into ongoing protest action. For instance, Burners without Borders , a community initiative to re-build infrastructure, was borne from the festival. Installations such as Burn Wall Street served a dual purpose; bringing activism to the forefront of the festival, while also sparking critical debate “back home”, as mainstream media reacted to the controversial image generated. Overall, Burning Man offers activists opportunities to practice prefiguration whilst helping to sustain future social movements, practically and ideologically. Significantly, it embodies resistance through the mode of cultural experience; collective action, creativity and celebration.